Heavy duty splash protection that is high in performance and comfort! This line of high performance chemical protection can be used in work environments where hazardous comtaminants may be present. ChemMax® 4 is at the top of the ChemMax line of clothing. 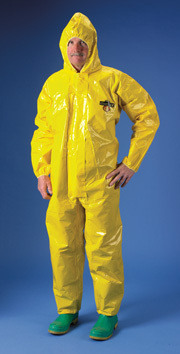 ChemMax® 4 features a 6 Layer protective barrier that will stand up to the toughest of hazardous chemical environments. Note: Chemical Restistance Data is in accordance with ASTM F739 test method. Testing is performed on fabric samples only, not finished garments. Sources for all test data are independent laboratories. All tests were performed under laboratory conditions and not actual use conditions. Basis Weight ASTM D3776 oz./sq.yd 6.5 oz. Grab Tensile XD ASTM D5034 lbs. 90 lbs. Trapezoidal Tear MD ASTM D5733 lbs. 51.2 lbs. Trapezoidal Tear CD ASTM D5733 lbs. 32.2 lbs. Ball Burst ASTM D3787 lbs. 141 lbs. sock boots with boot flaps.